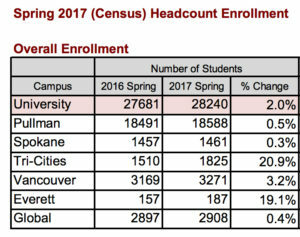 PULLMAN, Wash. – Washington State University has experienced its highest spring semester enrollment ever, registering 28,240 students statewide, up two percent from the spring semester of 2016. WSU President Kirk Schulz said that the semester enrollment numbers reflect a continuing trend of strong enrollment growth at WSU. But because providing WSU students with a transformative educational experience is key to the WSU’s “Drive to 25” goal of becoming a top-tier research university, he said he was encouraged that the enrollment data reflect a strong student retention rate between fall and spring semesters. Graduate student enrollments dipped slightly across all WSU campuses, with a total graduate enrollment of 4,115 students statewide, for a decline of 1.6 percent for the same period in 2016. Professional student enrollment, which includes veterinary and pharmacy students, increased to 992, up 5.6 percent from the spring of 2016. As it has for the past several years, WSU also grew increasingly diverse this semester, with the percentage of minority students across all campuses increasing to 28.8 percent, up from 27.6 percent in the spring of 2016. Minorities accounted for 23.8 percent of all new freshmen, 28.3 percent of new transfers, and 18.7 percent of new graduate students. WSU also continues to attract a large number of students who are the first of their family to pursue a college education. First generation students represented 33.9 percent of all WSU students statewide for spring semester, accounting for 35.6 percent of all new freshmen, 40.3 percent of new transfers, and 12.5 percent of new graduate students. As in years past, WSU continues primarily to serve in-state students. The spring semester enrollment figures show that 80.2 percent of all WSU students reside in Washington. A full 84.6 percent of undergraduates and 74.2 percent of all professional students, and 56.7 of all graduate students statewide are Washington residents.